The Holy Land is dying of thirst. Israel, Jordan and the Palestinian territories may once have been lands of milk and honey, but their fragile, semidesert ecosystem has been unable to withstand 60 years of overdevelopment, let alone war and occupation. The Jordan River is full of raw sewage. The Sea of Galilee is at its lowest recorded level, and the Dead Sea is drying up. One of the most passionately contested parts of the world, it is also one of the worst treated. Friends of the Earth Middle East (FoEME) sees that plight as an opportunity. The joint Israeli, Jordanian and Palestinian environmental organization got its start in 1994 trying to put environmental issues onto the peace process agenda. But after peace talks collapsed in 2000 with the advent of the second intifadeh, FoEME turned that strategy on its head and started using environmental activism to foster peace. 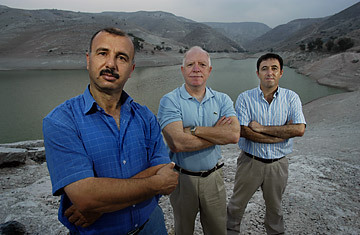 At a time of almost zero cooperation between Palestinians and Israelis, FoEME was building partnerships between Arab and Israeli communities in the Jordan River valley to teach water conservation, while also pressuring national governments to take action against pollution, overpumping and other wastes of water. FoEME projects such as Good Water Neighbors encouraged local leaders to reach out across conflict lines and make contact for the first time with local politicians on the other side. It was a step, says Gidon Bromberg, Israeli director of FoEME, toward creating an atmosphere of trust and respect that serves the broader goal of peace. FoEME also hopes environmental activism will show Israelis, Palestinians and Jordanians how their national destinies are inextricably linked. Any future Palestinian state will be dead on arrival unless it can negotiate the means to develop its own water system. Likewise, if Israelis want to fulfill the old Zionist imperative "to make the deserts bloom," they need to help the whole region live within the limits of a dry and vulnerable ecosystem. As for Jordan, it only stands to gain from a more rational apportioning of the Jordan Valley's scarce water supply. "We share the same environment, particularly the same water resources," says Bromberg. "And if we don't start working together, we're not going to have an environment." To highlight this interdependence, FoEME and architects from Yale University have developed plans for a Jordan River Peace Park. In coming years, they intend to create an ecologically protected zone on an island in the middle of the river, where Jordanians and Israelis could meet without passports or visas. (Unfortunately, Israeli travel restrictions may prevent Palestinians from going there.) FoEME hopes such ecotourism projects will replace water-thirsty industries such as agriculture in rural areas. The proposed park would also be a tangible way of fighting the mistrust that pushes countries to grab as much water as they can. "War will not generate water," says Nader Al-Khateeb, the Palestinian director of FoEME. "But peace can."